Earthborn Claypaint is a luxurious, ultra-matt clay paint for interior walls and ceilings. The unique recipe of Earthborn Claypaint results in a hard-wearing and highly breathable paint. Deliciously thick and creamy, it goes on like a dream and often requires less coats than conventional paints. All this and no horrible smells or emissions! 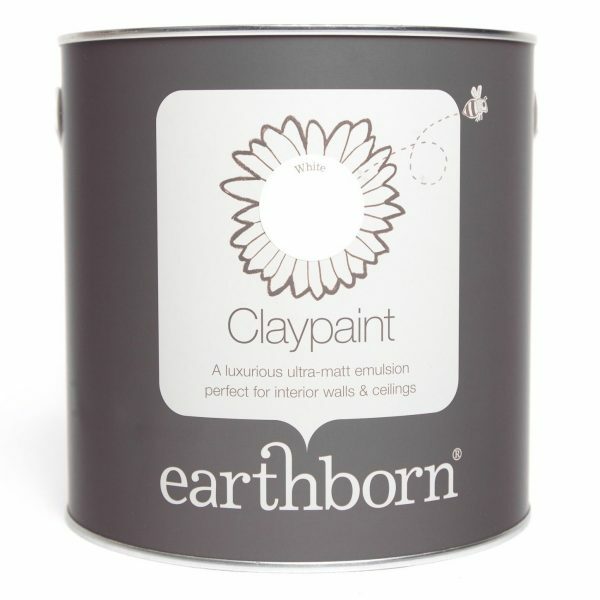 Thanks to its high proportion of clay solids, Earthborn Claypaint has a thick, creamy consistency which softens and enhances the light in your room. With similar levels of vapour permeability to limewash it’s also a highly breathable paint. The clay content helps to destroy airborne odours and contaminants. Overall, this contributes to a healthy, more comfortable living environment – which is especially important in old properties where damp could be a concern. Because it absorbs variations in humidity and deters mildew, this makes it perfect for areas that have to contend with steam, such as bathrooms and kitchens. Use clay paint on virtually any internal surface including previously painted walls and bare plaster. For a truly breathable finish it is ideal for painting internal lime plaster walls as an alternative to lime wash.
View the Colour Chart here or Contact Us to request we send one to you. Kinder to you and the people around you…. The clay in Earthborn Claypaint emits negative ions; higher ambient levels of negative ions are widely accepted as being beneficial to health and well-being. This leads to less static electricity build up, reducing airborne dust and allergens and resulting in a healthier choice. Clay paint is virtually free from VOCs (Volatile Organic Compounds) which have been shown to trigger asthma attacks, eye irritation, nausea, dizziness and other symptoms. Choosing a paint that is almost zero VOC is important if you or members of your family suffer from asthma or have allergies. With no unpleasant smells during or after painting it means your room can return to normal straight away. Therefore it’s perfect if you are sensitive to conventional paint fumes, are decorating rooms for little ones or looking for a safe paint. Combines all the qualities of natural clay and provides rich, warm, intense shades. Earthborn Claypaint is a virtually VOC free indoor clay paint for walls and ceilings that covers exceptionally well. It allows surfaces to breathe and absorbs variations in humidity, making for a more comfortable and healthy living environment. Thanks to the excellent environmental qualities of this natural paint, The Department of Environment Food and Rural Affairs has awarded Earthborn Claypaint the prestigious Ecolabel ‘Flower’ symbol. Earthborn is the only UK clay paint brand to carry the accreditation. Actual coverage will depend on the substrate and method of application. Remember, Earthborn Claypaint may require one less coat than you expect. Drying time: 6 – 12 hours. Coverage: Approx. 8 m²/litre per coat.